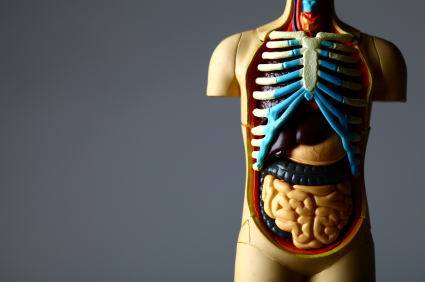 Your bowel acts as a sewer for your whole body, voiding not only the unwanted remains of what you eat but whatever your liver and intestines have excreted, in bile and catarrh. But if you can once clean your body enough to make little sewage in the first place, your bowel then contributes positively to your health in quite a different way. In health, no bacteria of any kind survive your stomach and occur in your small intestines where most of your food is absorbed. But residues discharged from there into your large bowel abruptly meet the bacteria that thrive there on its cellulose fibre content. Two of these, Bifidus and Acidophilus, never cause disease. The third type, known as Coliforms, only do so if they are forced to survive on meat instead of vegetable fibres. The first part of your large bowel is shaped like a cauldron, with your appendix dangling from its lowest part. Here the bacteria live by fermenting vegetable fibres into acids. This releases minerals from the fibres which didn’t soften in your stomach. The bacteria eventually die, releasing valuable minerals, vitamins and other nutrients in just the right organ to absorb it. This mechanism saved millions from starvation in post-war Europe and enables vegans to make up their dietary needs. New vegetarians acquire these bacteria gradually. The acid residues from this cellulose fermentation are not absorbed but ward off disease-forming bacteria and thrush . Enough fibre remains to cocoon the sewage and keep your faeces plastic and bulky, so that they are voided promptly — one to three times daily, often after a meal. Your whole bowel (except its cauldron) remains empty, clean and supple throughout your life. Things go badly wrong if you eat too much meat and too little fibrous vegetables, cereals and fruit. Meat is more chemically polluted than most food, and irritable intestines absorb chemicals they would otherwise reject. More chemicals arise from digestion gone wrong for lack of the gel formed by swollen vegetable fibres. That gel would have scoured your stomach and stopped polluted effluent from irritating your bowel. Instead, coliforms and thrush overgrow there and Acidophilus and Bifidus die off. Meat residues fester into poisonous products like ammonia that are reabsorbed to interfere everywhere through your blood, and paralyse your bowel muscle. Putrid faeces can hang around for days between bouts of diarrhoea, congesting your colon, veins, bladder and womb, and straining their ligaments. Your whole colonic apparatus stiffens gradually over the years with fibrous repairs from repeated strains and tears. An ‘irritable bowel’ is built normally and is not yet affected by structural changes of this kind, but is over-working against these odds. In ‘colitis’ your bowel has gone further and inflamed against its contents. You must help it get better or worse will eventually follow, perhaps after many years — constipation and diverticular disease probably, cancer perhaps. 1. Use the cleansing diet but without the preliminary fast. Avoid all meat, fish, hard cheese, tinned produce, eggs and dairy products for the first three weeks, to starve out the coliform germs. Eat only vegetables and fruit until your tongue is clean and pink; then never again use refined flour or cereals routinely. Use bran only as in the recipe for brose. After the first three weeks use natural yoghurt recipe to get your Acidophilus germs going again. 2. Fluid intake: Replace coffee and Indian tea with camomile, elderflower or lime-blossom (linden) teas, home-made barley water and honey cider vinegar, and watered fruit juice by turns. Drink plenty, half a pint before each meal. 3. Chew your food long and thoroughly. Never eat in haste or under pressure. 4. Exercise well in fresh air, breathing deeply. Bathe afterwards while still perspiring; finish with splashes of cold water, or wrap your belly tightly with a cold damp cloth and go to bed. 5. Homoeopathic treatment frequently helps. Try Chamomilla and Arsen. alb. for yourself, then seek expert help. Alternatively consult a practitioner of Traditional Chinese Medicine for a completely different approach.